A month ago today we were driving through the badlands of South Dakota stretching our drive time from 12 to 16 hours in order to reach Chicago by the 6th. We stopped to see where General Custer met his demise, but we zoomed past Mount Rushmore due to imminent darkness. By mile 3,500, we were anxious to get to the next place we’d call home. There was a palpable excitement in the car. I told the kids everything I knew of Chicago to try to give them perspective. But we all hungered to taste it individually. Today we drove across town to spend some time with my co-workers in the City Room at WBEZ. The kids asked if we’d be going through downtown. And because I do not yet know how to best navigate around this city, I said yes. The truth is we love to drive under the shadows of the tall buildings in downtown Chicago. We love to cruise up Lakeshore Drive and drink in the sights. We enjoy the cinematic adventure that takes place in the darkened windows of our Buick SUV as we drive through neighborhoods with distinctive and individualistic names. We discussed the Willis Tower-once-Sears-Tower conversation for a fifth time today as we drove past its monolithic dominance once again. This is what I love about living in a city. Although we do not live in the city properly, we feel it’s our own. The kids have already started to fall for the sporting teams, and I have no doubt they’ll be asking for Cubs, Bulls and Blackhawks jerseys by Christmas this year. We have a favorite beach, and though we’ve only really explored our neighborhood and Chinatown so far, we’ll love taking the double nickle to Cermak to eat dim sum every chance we get. I took the kids to Navy Pier to drop off some books and desk decorations on Saturday. They were awed at the awesomeness that is the happiest place in Illinois. 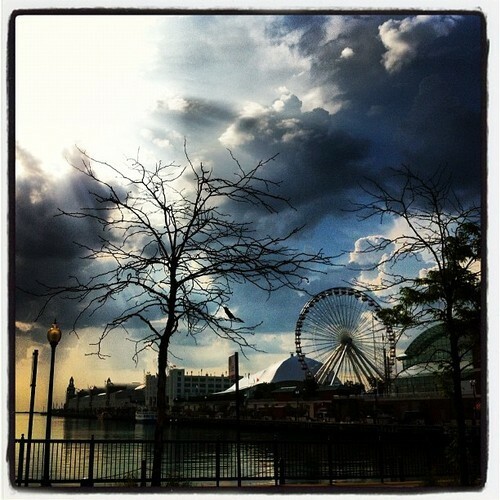 Truth be told, so am I.
I walk by that Ferris Wheel turning slowly in the afternoon sun and smile every day. I hope I’m doing that 10 years from now. And if you know me, then you know that means something.